Which one would you have gone to? Here’s a nifty home experiment that you can do without a grown-up! 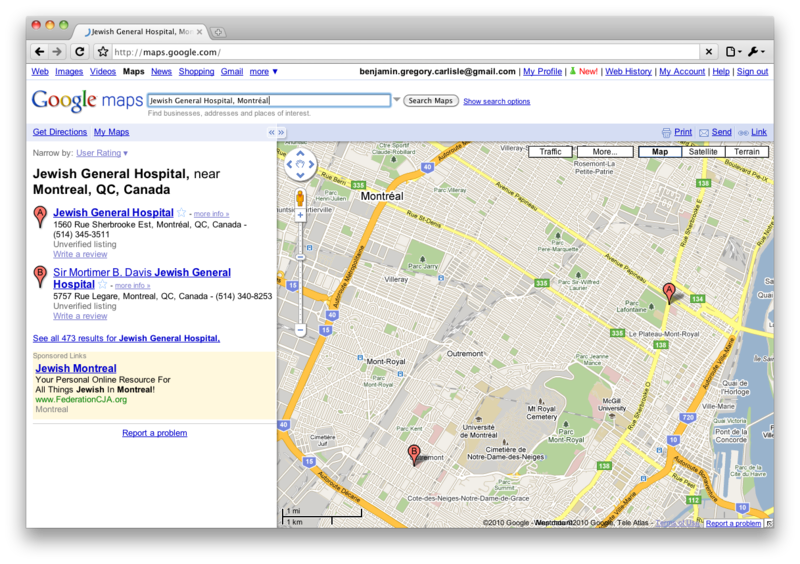 Try a Google Maps search for “Jewish General Hospital, Montréal.” You’ll get two results. Try to guess which one is the real Jewish General hospital. I’ll give you a hint: It’s not the one labelled “A. Jewish General Hospital.” The real one is clear on the other side of the city, and kind of near my home. So this morning I had an appointment with the ethicist at the Jewish General Hospital. I looked up the location of the hospital, and when I got the Google Maps result, I thought that there were maybe two “Jewish General Hospitals”—one that was the Jewish General simpliciter, and one that was the Sir Mortimer Jewish General. Since no one had ever mentioned to me that I was going to Sir Mortimer Hospital, I figured that I should go to the other one. A 35-minute Métro ride and a 5-minute bus ride later, I was at the hospital right on time, at 9 o’clock sharp. I was at the Notre-Dame hospital. 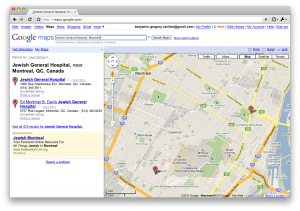 It turns out that the first address that’s given as a result in that Google Maps search is actually a completely different hospital that doesn’t have “Jewish” in its name at all. Quelle surprise. I called everyone that I could think of who was in Montréal, but no one was picking up at 9h on a lundi. I thought about hailing a taxi, but then I remembered that I didn’t have any money. I walked back to the Sherbrooke Métro and called Info Santé. For those of you in Ontario, it’s the Québec equivalent of TeleHealth. She was able to tell me where the Jewish General Hospital was. I found a map of the city in the Métro and looked for a hospital on Chemin de la Côte-Sainte-Catharine, and the nearest Métro stop. Turns out there are two hospitals on that street, Sainte-Justine and Jewish General. I went to the wrong one first. Fortunately, they weren’t too far apart. I arrived a bit over an hour late, and missed the appointment. I was still able to talk to the ethicist afterward, explain what happened, and attend another meeting, but it was a less-than-promising start to today. Posted on 2010 February 23 Author The Grey LiteratureTags Bioethics, Frustrating, Public transit, Why is this so hard?